anic raged through Criteria Studios in Miami. There was always pandemonium in the halls whenever the Eagles recorded there, with the yelling and fights and the horseplay, but this day there was more an element of fear, since the title song to the band's new album Hotel California, the one they had devoted the last nine months of their blood and souls to, was in imminent danger of losing the concept that originally made it so compelling. Don Felder had an idea. He was the one who constructed the song's basic elements, including the 12-string introduction and the solos at the end, back in Los Angeles on his four-track Teac tape deck. Calling his housekeeper, he sent her rummaging through the heaps of tapes in his home studio until she'd located the correct one, then had her play it to him over the phone while he recorded it on a professional Sony Walkman. 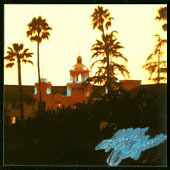 Hotel California, the Eagles' fifth album, was released in Dec. 1976 and became their third consecutive #1 LP. It remained at the top of the album chart for eight weeks and took up residence on the Billboard Hot 200 for 107 weeks. It was certified gold on Dec. 13, 1976, and -- two days later -- certified platinum by the Recording Industry Association of America. Back to Criteria he went, taking the cassette so he and Joe Walsh could re-learn all the guitar parts the band had liked in the first place. When they listened to the final mix, the five Eagles were a little taken aback by what they'd produced, and especially wary about releasing something not in their familiar rock pocket as a single. It turned out to be thier fourth chart-topper, entering the Billboard Hot 100 at number 72 on February 26, 1977, and moving to number one 10 weeks later. The LP would yield a final single, "Life in the Fast Lane," their first 45 to miss the Top 10 since "James Dean" went to number 77 in October, 1974. It didn't miss by much, though -- it peaked at number 11. Don Henley would later tell Rolling Stone that "Hotel California" was about "facing some of the harsh realities of fame and life in Hollywood" that the Eagles had endured on their way to pop superstardom. "Back in those times, every day was Halloween," Henley said. "The spiritual experimentation and sexual experimentation all mingled at some points." Henley attributed the song's lasting resonance to its "classic mythological form"; a quest where the hero grapples with dark forces he encounters during his odyssey. "It's all the stuff I learned in college," he said. "The difference is that it's set in the great American Southwest." In April, 1977, the group started a tour of England, Scotland, Scandinavia and Europe, returning to the United States for a summer series of outdoor concerts in sports stadiums. During the last leg of the tour, bassist Randy Meisner decided he'd seen enough hotel rooms in his seven years as an Eagle and left for the quiet of Nebraska to recuperate and instigate a solo career. Thre years later the title track of his One More Song album, featuring Henley and Glenn Frey on harmony vocals, revealed a "mythical tale" of his last night with the Eagles. On his own, Meisner placed three singles in the Top 30 from 1980-1982, the most popular of which was "Hearts on Fire." Following in Meisner's footsteps was the man who succeeded him in Poco, Timothy B. Schmit. "It's like a marriage and truly the most unified band I've ever been in," he told Circus. "We live with each other day in and day out so it has its Peyton Place-ascpects too... they could have offered me a salary as a sideman but they didn't want that. My offer was to be a full partner in the Eagles' organization." Schmit and his new brethren began sessions in February, 1978, at Bayshore in Miami for what would be the Eagles' final studio album, The Long Run. It took so long to finish that producer Bill Szymczyk joked, "We ended up nicknaming it The Long One. " Eventually, the difficulties encountered in the tense two years would also lead to the band's dissolution in the early '80s. The Eagles re-formed in 1994, embarking on a massively successful "Hell Freezes Over" tour, and their concert album of the same name went to the top of the charts and generated a single, "Get Over It." On his 2000 solo tour, Henley included "Hotel California" in his setlist, emphasizing the Latin and reggae influences of one of the Eagles' most successful and intriguing singles.